Not only does this motto describe Taco Bell‘s product mix of fast food that comes wrapped in flour tortillas rather than sesame seed buns, it can also be applied to Taco Bell’s marketing strategy. Taco Bell has done an exceptional job of adapting its strategy to the evolving social media sphere. In his book The New Rules of Marketing and PR, David Meerman Scott outlines what he refers to as the “new rules” for companies in a culture that seeks engagement and conversation with companies rather than being interrupted during their favorite TV show to be told to go buy something. Mr. Scott wants marketers to realize that, in today’s business environment, “marketing is more than just advertising” and that marketing is “about delivering content just at the precise moment your audience needs it.” The majority of his book is dedicated to explaining how various social media sites and tools can be used to accomplish organizational goals. I believe that Taco Bell does an exceptional job of using new social media sites, especially Facebook and Twitter, to build brand loyalty, engage in conversation, and drive traffic to their stores. On Taco Bell’s Facebook page, users express their love for the fast food franchise and it’s products despite the recent allegations made by an Alabama law firm regarding Taco Bell’s meat content. Several of the page’s 5 million fans have also posted over 500 pictures of Taco Bell food, locations, and sauce packets. Facebook isn’t the only social media outlet where people express their love for the restaurant chain: they also have over 55,000 people following the company’s Twitter account. Taco Bell has a smart strategy that it uses with its Twitter account that has as much to do with when the company tweets as what it tweets. Like other companies on Twitter, Taco Bell responds to customers and lets people know about their special menu items from time to time; what is unique about Taco Bell is that they tweet during the times that are considered peak hours for them: lunch and FourthMeal. This strategy not only gets people tweeting about Taco Bell on Twitter in the hopes of being retweeted (a goal I have yet to accomplish on Twitter myself…), but it also bombards the feeds of all the users who follow Taco Bell with how people are enjoying Taco Bell at that moment. This helps to keep Taco Bell in the all important “consideration set” of consumers as they decide where to spend their money on a fast food meal. Taco Bell is truly “thinking outside the bun” when it comes to utilizing the new tools available to marketers. The company compliments its traditional advertising by engaging its highly loyal fan base on popular social media sites. I can’t wait to see what Taco Bell will do next with its marketing strategy in this exciting time in the progression of marketing thought. That is the definition that inspired Jack Dorsey and several others to create a 140-character messaging service that eventually became popular social media website we know today as Twitter. 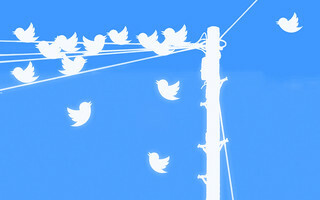 Since it’s launch on July 15, 2006, Twitter has grown to over 180 million users who create over 65 million tweets a day! (Thank you Wikipedia) As a marketing student and social media enthusiast, I have enjoyed using Twitter for the past year and a half or so to find and share information about the things that I am passionate about (like #marketing, #socialmedia, #theology, #business) as well as be entertained by tweets from @ochocinco and several others. Aside from my personal profile (@LawsonHembree), I have also managed the Twitter account for the Arkansas World Trade Center (@ARWTC). From my experience with these two accounts, I’ve always gotten to see more of the “business side” of Twitter. However, like a mullet haircut, while Twitter is all “business up front,” there is also a “party in the back.” This post will take a brief look at both sides.